"When you are fully focused on doing what you enjoy, you are in the flow, and it is then that you are most likely to make successful decisions free from doubts and insecurities." Hey! I can't believe the year is almost over. I had decided not to trade for this whole week. Yes, it is the holiday season but I know the markets are still trading! And yes, I am still watching $EURUSD for any potential moves. But more than that... I know that for a short term trader like me, if momentum is choppy, I can get killed. One good news and something to look forward to is that I think I may have finally found a trading strategy I really like. It seems to be working so far. Interestingly enough, I found some nice confirmation of my plans in these 2 great webinars that was held earlier this week. The first video is titled Potential Forex Entries by Raghee Horner for Interbank FX. 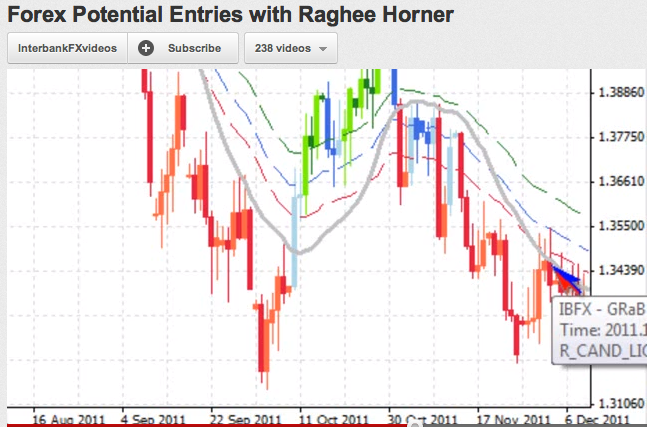 Raghee Horner is the creator of GRab charts/indicators. I've read her books and love listening to her talk. Her charts are a wonder to behold. Market swings and movement always seem so amazingly evident when you look at it through her charts. Although I don't trade with the GRab Indicators (I've tried them but I can't seem to get the hang of them on the 1M timeframe), I do love listening to her views on the market. She does a really nice discussion about multi-timeframe entries around 6 mins into the video. My favorite take-away from this video is around 11mins when she discusses where she would take profit. She calls it being "proactive" about realizing profits. I like the dual-profit target strategies because I usually feel psychologically less stressed after I have realised some gains. I've been a long time follower of Boris's Scalping University videos on youtube. It was from here that I learnt about the "magic" 00 levels for Support and Resistance. (Yes, it's S/R again). I also love his bullet-speed presentation style. My favorite take-away from this latest webinar is this phrase: "The more you trade, the more you lose". He starts talking about this golden rule about half way through the webinar. 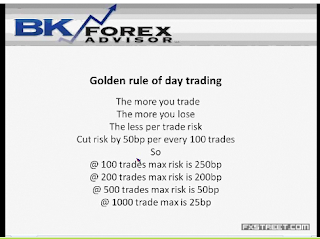 And he even outlines the amount of risk you can effectively take by the number of trades you are going to take. So the more trades you are taking, the less risk should be on the table. No kidding, it absolutely resonates with me at this time of the year. Coincidentally, I have been toying with this idea of making less trades. You see, trading off shorter timeframes logically means that I should be able to take more trades per day. I had taken this phrase literally in the past 2 years. Painfully, I had to be jolted back into reality many times, by a blown-up trading account. So that statement on making more trades in a dayto get more profit is abso-xxxx-ing lute-ly not true, at least not for me. Trading more just made me lose more. So in the throes of my profitable days, I am devising a plan to trade less and achieve a smaller target. On the premise that my entries will be more selective. So I have set up a plan to backtest this over the holidays. (Yes, even though - I still hate back-testing). I hope you enjoy these two videos. I certainly did and I am definitely going to listen to them again. And as always ....Happy Trading!